SnapRapid’s ongoing analysis of professional football has given us expert insight into how fans connect and engage with their favourite clubs. Fans are moving beyond just passively following official club accounts and consuming sports news. They are creating their own content to showcase their passions and connect with fellow fans worldwide. Fan-generated content provides significant earned media value for clubs and their sponsors, as fans favour visual formats. In 2016, we foresee the value to clubs and sponsors from this content increasing significantly. Take for example Manchester United, which has a very large social media presence, with official accounts in several languages followed by millions of fans. Additionally, the club is covered extensively on social media by popular news and sport media sites. Nonetheless, fan-generated content drives a considerable share of impressions and engagements for the club and its shirt sponsor, Chevrolet. In the first half of the 2015/16 season, fan-generated content contributed 10 per cent of all original post (e.g., not retweets) potential impressions for Manchester United. This provided the club with 170 million extra potential impressions from the original postings alone, not including retweets/regrams, which potentially translates into millions of pounds of earned media value. Fan-generated content has differing magnitudes of impact between platforms, however. 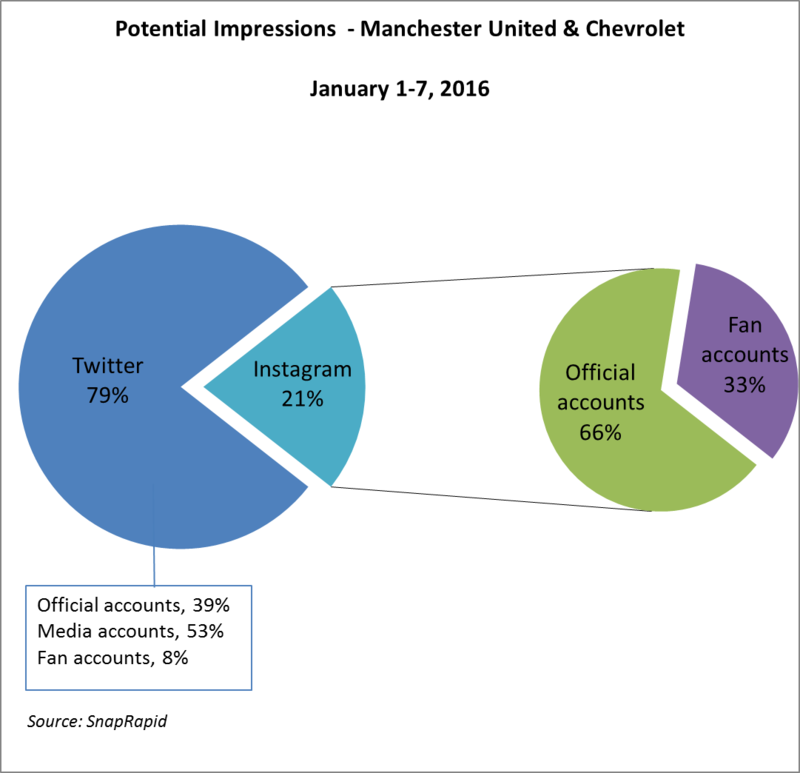 The below graph shows the original post potential impressions generated for Manchester United and Chevrolet in images shared on Twitter and Instagram during the first week of 2016. Twitter generates the majority of potential impressions, which is largely due to official accounts for Manchester United and its players, the Premier League, and news sources, with tens of millions of followers between them (official club, league, and player accounts generated 39 per cent of potential impressions on Twitter, whereas media accounts generated 53 per cent ). However, when one looks at Instagram separately we see that, of all photos with Chevrolet exposure, one-third were posted by fan accounts; there was no exposure from any media accounts. This translates to 7.9 million additional potential impressions for Manchester United and Chevrolet on Instagram for the first week of January alone, and significant added earned media value. 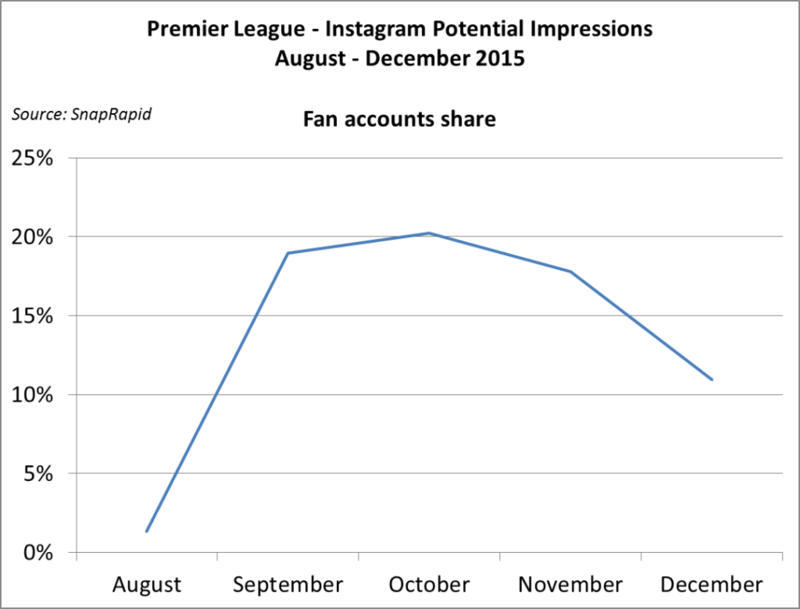 This is indicative of a larger trend for fan posts on Instagram over the first half of the season; fan-generated content accounted for an average of at least 14 per cent of Instagram potential impressions for all Premier League clubs and their sponsors. Peaking at 20 per cent in October, the share decreased as the year finished, which is to be expected as clubs and news sources increase their coverage as the Christmas matches and January transfer window come into consideration. Fans show a proclivity for creating visually-impactful content, which is why they are responsible for a larger share of potential impressions on platforms such as Instagram. Visually striking content is mobile-friendly and extends beyond language barriers, so fans can unite in their passions at a truly global level. This global language of fan-generated imagery present clubs with a unique opportunity to crowdsource inspiring content that benefits both fans and sponsors with increased exposure and engagement. Football fans have long found new ways to express themselves creatively, so the growth of this tendency in the digital space is natural and will only become more important in 2016 and the coming years. It is crucial clubs and sponsors take notice of how this fan generated-content provides exposure value, and implement advanced, intelligent brand tracking to ensure that they capture it fully.